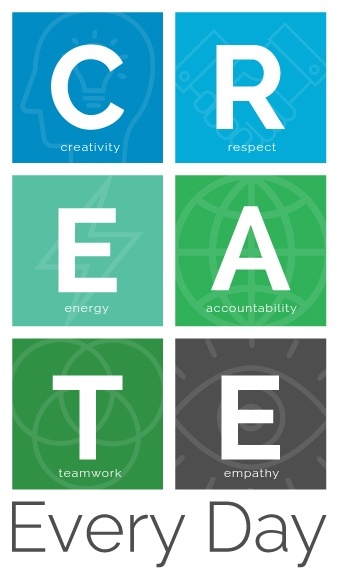 What are Idea Grove's core values? Idea Grove's values are summarized in the agency's mantra: "CREATE Every Day." Idea Grove believes in balance in the lives and careers of our team members. This is reflected in the agency's six core values and their relationship to one another. We encourage team members to be creative and opinionated in sharing their ideas, but we balance that with always respecting ideas that are different from our own. We say "Yes and"—never "Yes but"— when collaborating on solutions for our clients. We expect everyone to bring energy to their work and to always do their best, but we know that our best will vary from day to day. Sometimes we don't feel well, or we are having challenges in our home lives. We try to demonstrate empathy for one another every day. We want everyone to show accountability and ownership in their work, but we recognize that Idea Grove is a team sport, not an individual one. Individual accountability and agency teamwork balance one another every day.